How Do Buzzards Know if an Animal Is Dead? Scavengers, buzzards wheel in graceful circles as they ride wind currents searching for food. Their favorite food is fresh carrion, but they'll eat an older carcass if food is scarce and it hasn't putrefied. The birds' keen sense of smell enables them to pick up airborne chemicals that signal an animal has died. Many birds have little or no sense of smell, as evidenced by primitive olfactory receptors in their brains. By contrast, vultures' olfactory organs are large and well-developed, with numerous nerve endings. The sense of smell can help locate a meal as small as a dead mouse from a mile away, even when a canopy of trees blocks the buzzard's keen eyesight. Old world vultures do not have this heightened sense of smell and rely solely on sight. Ethyl mercaptan is a chemical consisting of carbon, hydrogen and sulphur that is naturally present as a byproduct of metabolism in live organisms. Responsible for such unpleasant smells as flatulence and bad breath in the living, it is released in large quantities after death. 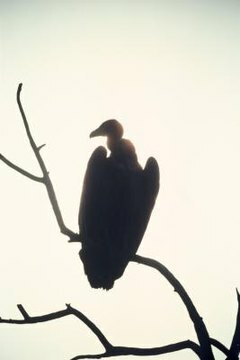 Most vultures will not register a creature as edible unless mercaptan is present in quantities equivalent with death, and will flap away into the sky if a potential meal moves. While buzzards primarily consume only dead creatures, black vultures are known to make exceptions, sometimes catching fish, skunks, turtle hatchlings or newborn farm animals such as piglets, lambs or calves. Black vultures hunt in large groups to overpower live prey. Black vultures can also be found picking through garbage at landfills or hanging around city dumpsters. You can easily tell them by their black, naked heads, which contrast sharply with the those of the more common red-headed turkey vultures. If you live in an area where buzzards are present, you can attract the peaceful birds to your yard to view them up close by tossing raw meat or roadkill in an area where neighbors won't be disturbed by the scent of decaying meat. Vultures prefer fresh carrion to that which is rotten and putrid, and the meat of herbivores over predators. Small dogs and children have nothing to fear, as body movement and lower levels of mercaptan let vultures know they are alive. Do Vultures Have a Sense of Smell?